Modern and Cenomanian simulated surface temperatures. Greenhouse climate intervals. The Cretaceous (145-66 Ma) was an interval in Earth history of extreme warmth. As such, it represents an important case study for how the climate system operates under warm conditions like those we might face in the near future. 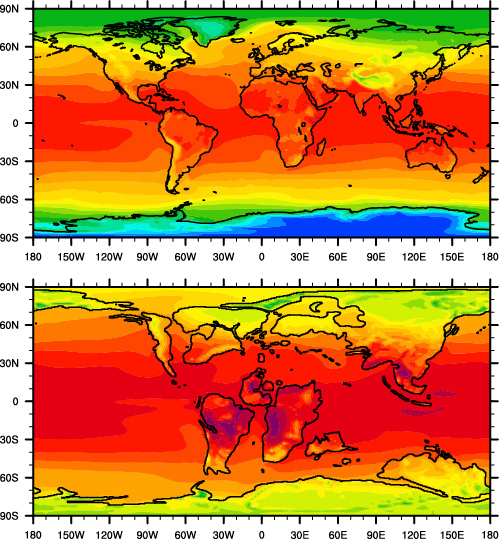 The study of greenhouse climates is of particular importance because current earth system models fail to adequately simulate such fundamental features as the pole-to-equator thermal gradient. Ice ages. We currently live in an ice age, yet for most of the geological past, ice ages were rare. We are interested in explaining the factors that both gave rise to and ended these exceptionally cold periods. Transitions. Earth’s climate history is rich with change and punctuated with important transitions, such as Antarctic glaciation, the establishment of the tropical Pacific thermocline, or the onset of the monsoon system. The source of these transitions is uncertain. Some of these may be related to the evolution of life, such as the rise of terrestrial plants in the early Paleozoic or the expansion of C4 grasslands in the Miocene. Others are likely related to the movement of continents or variations in atmospheric composition. Our goal is to determine the cause of these large-scale transitions. Poulsen, C.J. and Zhou, J. (2013). Sensitivity of Arctic Climate Variability to Mean State: Insights from the Cretaceous. Journal of Climate, 26, 7003-7022, doi: 10.1175/JCLI-D-12-00825.1.